European University Viadrina is located in the heart of Europe in the vicinity of the German-Polish border. Viadrina is the central cradle for intercultural exchanges, science, economy and the East-West connecting policy. 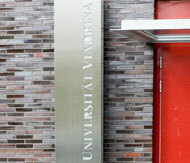 Currently there are more than 6000 students enrolled at the Viadrina. The percentage of foreign students -897 students from Poland and more than 600 from 70 countries worldwide- reflects the intercultural profile and enhances the crosscultural dialogue between different cultures. Moreover the teaching staff is also international at the University Viadrina. The increasing number of professors from all over the world is yet another evidence of openness towards the intercultural teaching exchange in the scientific domain.